Update 4: A second junior Brexit minister has resigned – Suella Bravermanm MP for Fareham. This leaves just two of the five-person Brexit team remaining. Leaving the EU on 29 March 2019. Ending free movement and taking back control of our borders. No more sending vast sums of money each year to the EU. A new business-friendly customs model with freedom to strike new trade deals around the world. A UK-EU free trade area with a common rulebook for industrial goods and agricultural products which will be good for jobs. A commitment to maintain high standards on consumer and employment rights and the environment. A Parliamentary lock on all new rules and regulations. Leaving the Common Agricultural Policy and the Common Fisheries Policy. Restoring the supremacy of British courts by ending the jurisdiction of the European Court of Justice in the UK. No hard border between Northern Ireland and Ireland, or between Northern Ireland and Great Britain. Continued, close co-operation on security to keep our people safe. An independent foreign and defence policy, working closely with the EU and other allies. And in light of recent advanced by democrat socialists in the US, it probably wouldn’t be too ridiculous for the UK to make a hard left turn next as well. Update 1: Confirming earlier rumors, Sky News reports that Steve Baker, Britain’s junior Brexit minister, technically the Brexit minister for “contingency planning”, is the other (for now) conservative MP to resign alongside Davis. In what has been called “an absolute bombshell”, U.K. Brexit Secretary David Davis resigned from Theresa May’s government late Sunday, one week before the UK is scheduled to present its demands to Brussels. Davis resignation comes two days after May received backing from her cabinet for a new “soft Brexit” plan which envisioned maintaining close ties with the EU after the UK’s departure from the block, news which was cheered by the UK business lobby and which had set cable on an upward trajectory in early Asia trading, before the news hit, which halted the pound’s ascent. The cabinet signed up to the proposals, which were hammered out at Chequers – the country house of the UK Prime Minister – last week. May is due to unveil the plans tomorrow in parliament, before a potentially stormy meeting with her own MPs. 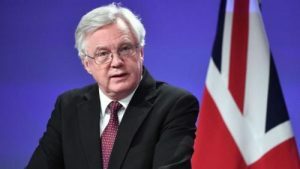 Davis had disagreed with May’s plans for keeping EU rules for goods and adopting a close customs model with the bloc, and his resignation threatens more political turmoil, this time in the UK, as moderates are set off against hard brexiteers. As Sky News adds, some pro-Brexit Tories are angry about the plan and there is speculation it could end up in a leadership challenge. Sky’s political correspondent Lewis Goodall called the resignation of Mr Davis “an absolute bombshell”. 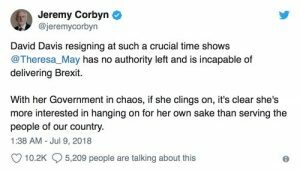 He said: “To resign tonight after the emergency meeting at Chequers on Friday is really quite shocking when you consider, apparently according to the briefing we received, that every single member of the cabinet – admittedly some with their reservations – all agreed that they would support the prime minister’s proposals and they would defend them in public. Meanwhile, Foreign Secretary Boris Johnson reportedly described defending the plans as like “polishing a turd” during the Chequers summit, before eventually falling into line behind the prime minister. 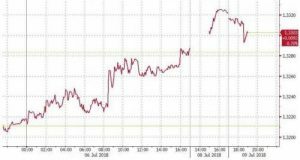 As a reminder, late on Friday Theresa May won approval at an all-day Chequers summit for a pro-business plan to keep Britain intimately bound to the EU single market and customs union, beating back Eurosceptic cabinet opposition to her new “soft Brexit” strategy, the FT reported. May briefed the media at 6.45pm on Friday that the cabinet had agreed a collective position to create a “UK-EU free trade area which establishes a common rulebook for industrial goods and agricultural products”. The plan would see Britain commit in a treaty to adopt new EU rules for goods— an approach viewed by some Tories as leaving the UK as “a vassal state”. Parliament could break the treaty, but trigger severe market reprisals from the EU if it did. May challenged critics including foreign secretary Boris Johnson to back the plan for a “UK-EU free trade area” in a confrontation seen by senior Tories as a decisive moment in the tortuous Brexit process. Johnson and five other cabinet ministers met on Thursday night at the Foreign Office to plan a counter-attack to try to preserve a clean Brexit, but they eventually concluded they could not stop Mrs May’s plan. “People are not happy with what is being proposed but people are keen to keep the government together,” said one of those at the meeting at Mrs May’s country residence. May’s team had vaunted the prime minister’s ability to face down the Eurosceptics, encouraged by pleas from mainstream Conservative MPs that the time had come for her to tell her critics to put up or shut up. Davis’ unexpected resignation threatens to further inflame cabinet tensions, especially in light of an earlier Mirror report that 42 lawmakers had formally expressed no confidence in Theresa May. A leadership contest would be triggered if 48 Conservative MPs formally submit letters. May said on Friday that the proposals were “good for the UK and good for the EU” and would “deliver prosperity and security”.